One of the issues that we came across fairly quickly when converting some projects to Linq was how unusable the default Linq to SQL utility was. The interface worked extremely well for 2 or 3 tables, but quickly became unmanageable with much more than that. We began looking for other solutions, and discovered a command line utility called SQLMetal that can be used to generate a DataModel from a connection string and/or an XML file. The solution we settled on uses SQLMetal to generate XML markup from the database, then uses XSL Transformations to make desired property/model changes (Private properties, Delay loaded, etc), and then uses SQLMetal to generate a code file from this XML file. "%~msxsl.exe" "%~dp0DataModel.dbml" "%~dp0ModifyDbml.xslt" -o "%~dp0DataModel.dbml"
The second line of this script uses a utility called msxsl.exe (note that this requires MSXML). 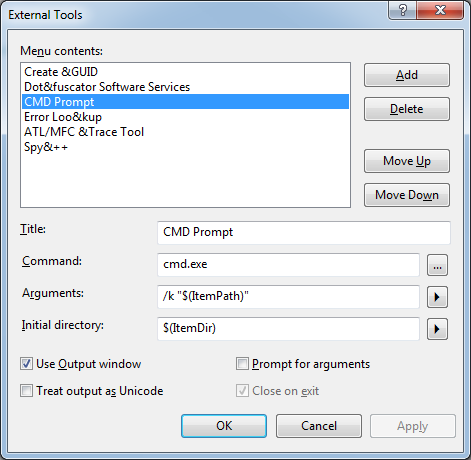 This program uses a file called ModifyDbml.xslt to perform an XSL tranformation on the DataModel.dbml file. This will make it so the “AddressID” property of “Person” is a private property – and this is where all such DataModel changes should be stored. Note that any changes made directly to the DataModel after this point will be lost each time the files are generated. The final line of this script generates a DataModel.cs file from the updated XML file. This allows you to highlight the updateModel.bat from Visual Studio and go to “Tools->CMD Prompt” to update your DataModel. Occasionally, I like to write static methods on classes. They are useful whenever the method loosely relates to to the class – but it doesn’t involve a specific instance of the class. A good example of a static method in the .NET library is the int.Parse(string val) method. This method basically reads a string and tries to return an integer representation. The method logically fits with the int Class (I suppose a string could have a ToInt() instance method…but that would be overwhelming as you added ToFloat(), ToDecimal(), To…()) – but when you run it, there’s no reason to have an instance of int already. You run it to create a new instance of int. 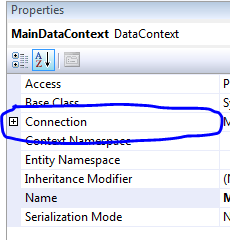 The issue with static methods in your business logic is that you often need a common object to talk to the database through: a SqlConnection, a TableAdapter, A LINQ DataContext, etc. I could certainly create those objects locally inside each static method, but that’s time consuming and hard to maintain. I want instead to define a common property (in the business class or a parent class of it) that lazy-initializes and returns an instance of the object when I need it. The problem is that the property must also be static for a static method to have access to it. The tricky thing is that this will probably work in development and testing, until you get some load on your website. Then, you’ll start seeing all kinds of weird issues that may not even point to this code as the problem. Why is this an issue? It’s all about how static variables are scoped inside a ASP.NET application. Most web programmers think of each page in their application as its own program. You have to manually share data between pages when you need to. So, they incorrectly assume that static variables are somehow tied to a web request or page in their application. This is totally wrong. Really, your whole website is a single application, which spawns threads to deal with requests, and requests are dealt with by the code on the appropriate page. Think of a page in your webapp as a method inside of one big application, and not an application of its own – a method which is called by the url your visitor requests. Why does this matter? Because static variables are not tied to any specific instance of any specific class, they must be created in the entire application’s scope. Effectively, ASP.NET static variables are the same as the global variables that all your programming teachers warned you about. That means that, for the property above, every single request/page/user of your website will reuse the first created instance of DataContext created. That’s bad for several reasons. LINQ DataContexts cache some of the data and changes you make – you can quickly eat up memory if each instance isn’t disposed fairly quickly. TableAdapters hold open SQLConnections for reuse – so if you use enough classes of TableAdapters, you can have enough different static vars to tie up all of your db connections. Because requests can happen simultaneously, you can also end up with lots of locking/competing accesses to the variable. Etc. In this case, each instance of DataContext will automatically be disposed for each hit on the site – and DataContexts will never be shared between two users accessing the site simultaneously. You could also use collections like ViewState, Session, Cache, etc (and I’ve tried several of these). For my purposes, the HttpContext.Items collection scopes my objects for exactly where I want them to be accessible and exactly how long I want them to be alive. “The member ‘Table1.DisplayName’ has no supported translation to SQL.” exception when executed. One simple solution is to just define your sort option each time it needs used. This option is pretty tedious to write and maintain, especially if you’re going to be using the function often. Another option is to define a System.Linq.Expression, which is a lambda expression that can be converted to SQL. Note that if you do choose this way, the “DisplayName” is essentially defined in two different places. To solve this problem, use the expression to define the property. Note this method can also be used to define functions that accept arguments, so the following code also works as expected.